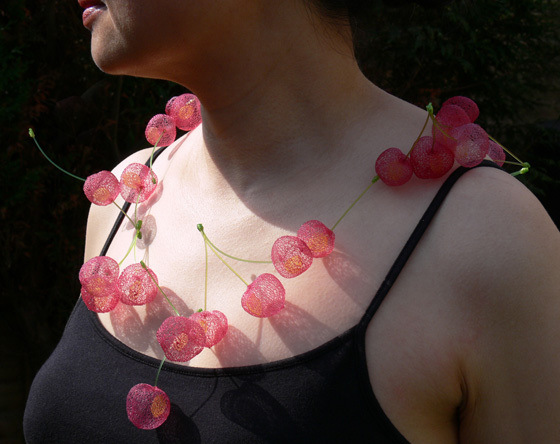 Hong Kong-born maker Nora Fok uses nylon fishing line to make complex jewellery inspired by a wide variety of natural forms. Her delicate, intricate structures push jewellery to a new dimension, transforming organic forms into wearable, ethereal sculpture. 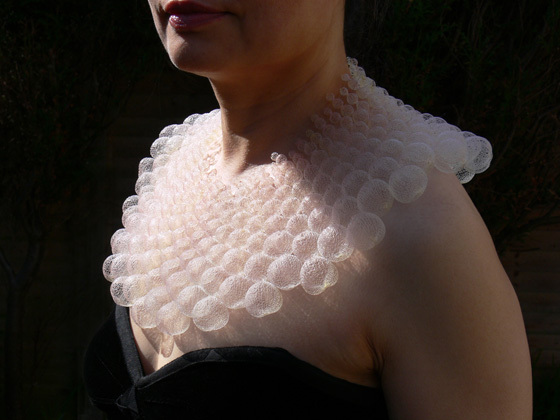 Fok was short-listed for the Jerwood Applied Arts Prize 2007: Jewellery and her work is in several national collections including those of the Victoria and Albert Museum, the Crafts Council and the National Museums of Scotland. Can you explain how you came to work as a jeweller? I first trained as a graphic designer in Hong Kong, doing several courses at the polytechnic in design and in advertising during the 1970s. But I always knew that graphic design wasn’t really for me – it was exciting but there was something not quite right about it. So I decided to come to the UK to find out what it was that I wanted to do and I ended up doing a course studying Wood, Metal, Ceramics and Plastics at Brighton Polytechnic. This was what started me on jewellery as I was very, very lucky to have two inspirational teachers there – Caroline Broadhead and Susannah Heron – both played a really important part in helping me develop my jewellery. The new jewellery movement was gathering momentum when you were at Brighton, did it influence your work at all? The new jewellery movement was all about looking at and using different non-traditional materials and I was really taken with it. Lots of new, interesting materials were being used on the course and we experimented with different materials like resin, fibre glass and acrylic and one tutor, who was a keen angler, bought in some nylon fishing line. I spent a lot of time playing around with the fishing lines and experimented with knitting and knotting it. I also learnt to use dye to colour it. How come you decided to concentrate on nylon thread rather than any of the other materials you experimented with at Brighton? It was partly for practical reasons. 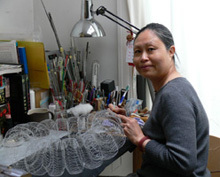 When I went back to Hong Kong I didn’t have a studio or very much space so couldn’t work with aluminium or anything that needed a lot of equipment, but I could carry on working in nylon at home. I also felt that there was something there for me to discover and that there was something special about this material – it was only invented in 1935 and was very new and exciting. I felt that it had lots of potential and wanted to carry on working with it, especially as it was easy to manipulate. I loved the way it is so tactile and the way that it is warm when you wear it against the skin. It also responds well to dying. In 2004 I did a workshop at the Massachusetts College of Art and had the opportunity to visit the Glass Flowers exhibition at The Harvard Museum of Natural History. The exhibition marked a turning point in my creative work and I started to study plants intensively – I dissect them and look at their geometry and underlying mathematical order as well as their surface pattern. 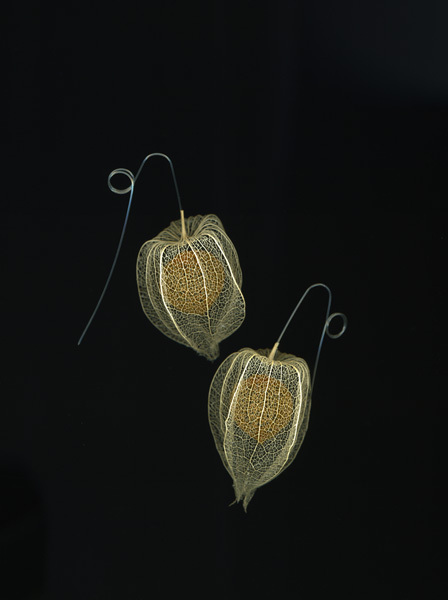 I had always enjoyed making organic forms because the nature of the nylon thread made these shapes fairly easy to produce, but since my glass flower experience I have spent a lot more time studying the natural world and have found lots of things there that I’ve never seen before. My Nylon Botanicus Collection was the result of some of my studies. Does your Chinese heritage feed into your work? When I was a child I was taken to Chinese operas and I loved the ‘bling’ of the traditional costumes – they were colourful, glittering and fantastic. My early work was related to these costumes, but instead of using gold and precious materials I redesigned them in nylon. I was also influenced by the elaborate forms of the costumes and to begin with I used shapes like the headpieces with dangling tassels as a reference. It’s difficult to pin point how the idea and the piece come together. I do lots of studies of a particular flower that interest me, and then I might scan the flower so I can enlarge it on the computer, then I might leave it for a bit before coming back to it and trying to construct a piece around its form. 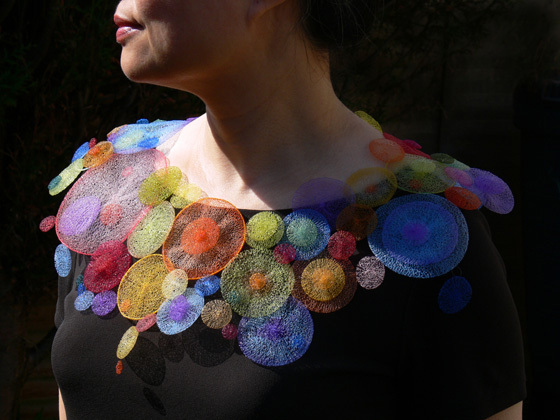 I quite often have to make several test pieces, working out the colours and sizes as well as the structures. There are always a lot of different possibilities, but I use my judgement to work out where I want to go, making decisions as I go along. The majority of my pieces are one-offs so the whole making process is very experimental and time consuming. Do you enjoy working on commissions? Yes - I learn so much through commissioned work. For example, when I was asked to make something for Weaving Stories at the City Art Centre in Edinburgh in 2002, I was told that I could make whatever I liked as long as it was woven. This was really beneficial for me as I spent a lot of time learning how to weave properly – before that I had just been playing around with weaving and afterwards I was able to create my own jewellery using different weaving techniques. Secretly I want to do much larger scale work and would like to make more sculptural objects rather than practical, wearable, saleable forms. I did a wall hanging 2 metres x 2 metres for Seeing Dragons in the Clouds [an exhibition at the Museum in the Park, Stroud, earlier this year] and I really enjoyed working on that. I also have a lot of crazy ideas - like building a cocoon form around the body – that maybe one day I will do.